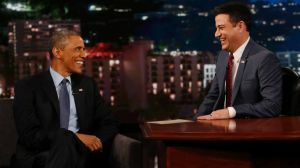 President Obama and Sean Penn were both guests last night on Jimmy Kimmel Live! Jimmy asked President Obama if he’s seen Fast Times at Ridgemont High and he replied that the film is “a classic”. “I lived it, man,” he said. “I didn’t just see it.” This definitely tops George Bush quoting “Show Me The Money” from his State of the Union address. Sean Penn also discussed the film (see that clip below). The third guest last night? Earth, Wind & Fire….perfect, right? Enjoy! Available Now: Fast Times Blu-ray! Crowe’s Nest: Fast Times Reunion, PJ20 Companion Book, Reader Art & More! So, the President rocked “Kashmir” on his first date with the First Lady?